I love recipes that have only a few ingredients. This is one of my favorites. Sometimes I make it to warm up the house on a chilly day. On those days I bake it at 250 degrees until the internal temperature reaches 170. Other days I back it on 350 and bake potatoes with it. I wash the chicken and rub butter all over it. I sprinkle salt and dried tarragon leaves all over it. I place it on the center of a Bundt pan and place the pan on a cookie sheet to catch the drippings. The chicken browns nicely all around when baked this way. Tarragon chicken and baked potatoes. 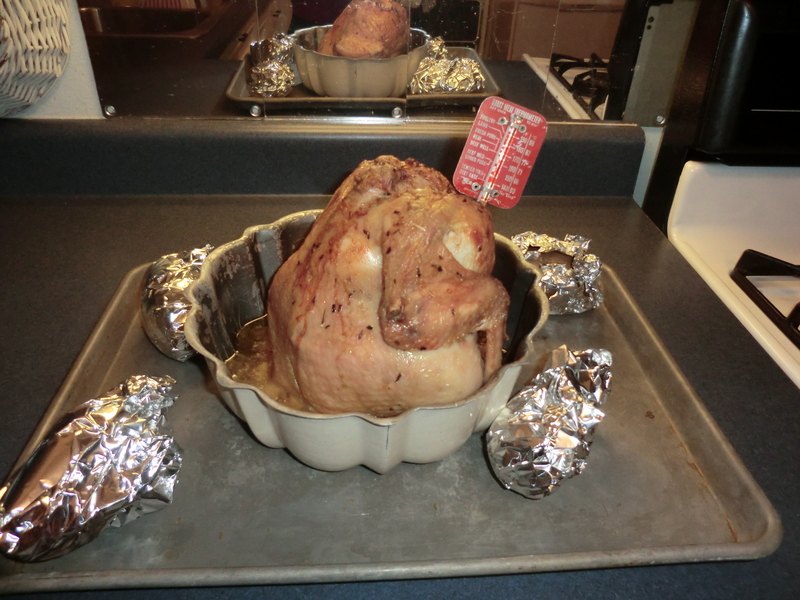 This entry was posted in Food, Make It, Money Saving Ideas, Recipes and tagged dinner, Food, internal temperature, Make It, rub butter by Frugal Fish. Bookmark the permalink. yum!! I want to try this!